OK, so there is no longer any snow in Britain anywhere, so what do I do? Move to snowy Norway. 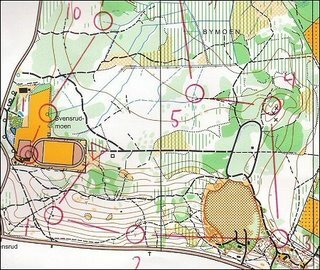 After the JK I jumped on a plane to Oslo, and I am now spending two weeks here preparing for TIOmila and doing some technique training. Last night I took part in a night relay with my club, IL Tyrving. Each team was made up of 4 runners, but the first and second both ran at the same time, with the second to finish sending out the 3rd runner. Anders Tiltnes and I finished within 5 seconds in 3rd and 4th place (just behind Jorgen Rostrup) to send out Morten Christopherson (who ran 3rd and 4th legs for us) off in the lead. He dropped two places, but we still finished in 3rd place. We were rewarded with cool bags (ideal for TIOmila beer supplies?) and a very late night. Luckily there was not too much snow in that forest, but my other training so far has been in forests with at least some snow coverage. Results from Tyrinatta here. First (and last) part of the race.